Will my Roof be Safe?
" 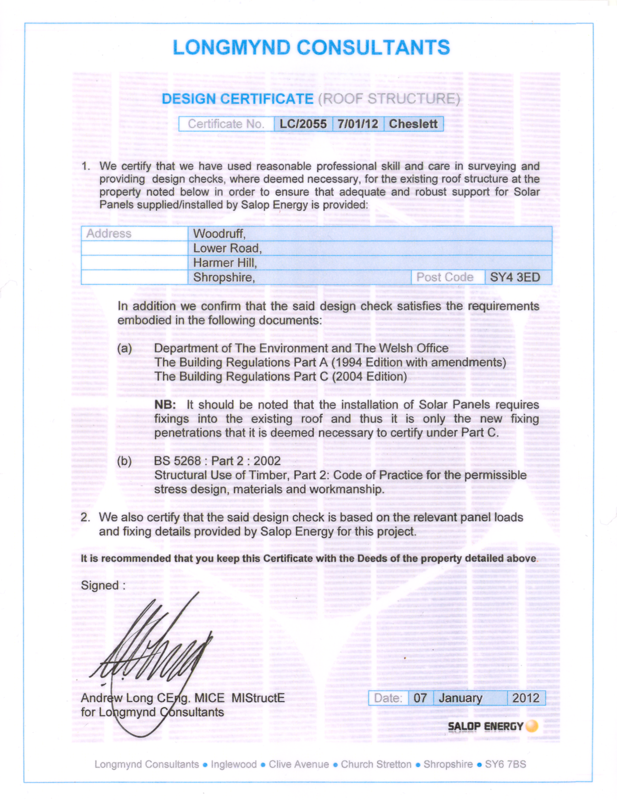 Phill Crawley, the instigator of the solar scheme at Sunrise Eggs, commented: The decision to invest the kind of capital we have in this scheme..."
If you are considering a roof mounted solar energy system the first priority is to validate and certify that your roof can take the extra weight (and get a certificate like this one.) This is a Building Regulations Part A requirement – applicable when the additional solar system load exceeds plus or minus 15% of your roof’s existing load bearing capacity. Unfortunately, existing roof load bearing data is generally not to hand which means it needs to be surveyed and calculated. This demands a detailed roof survey, not a man in a van giving your roof a cursory glance. Our 10 page, Solar Safe Survey has been developed in association with a highly regarded, local Chartered Structural Engineer [CSE]. It helps harvest all the essential information our CSE needs to provide a professional opinion. We also check your electrical supply at the same time. To book a Solar Safe Survey please email info@salopenergy.co.uk or call us on 01743 236266. Offering proper, professional assessment of roof structure and suitability for the chosen array - no other company offered this. Excellent showroom - again no other company could show any real items, only photographs/pictures. Whole process was first class.